The first shipment of imported goods through the Lapis Lazuli Corridor arrived in Herat province, in the west of Afghanistan, on Monday. The convoy took Afghan goods to Turkey via the new transit route last December and returned home while carrying imported goods. The arrival of the shipment was warmly welcomed by Herat residents and officials. However, local officials said the Afghan drivers faced some problems on their way to Turkey and back home. “One of the challenges of the Afghan trucks’ convoy was that they could not load more goods from other countries except Turkey and, meanwhile, they were faced with some hurdles on their way,” said Mohammad Yunus Rahnaward, head of Herat transportation department. Nazir Ahmad Rahimi, head of Afghan TIR International Transport, said the corridor has provided a good opportunities for transit of Afghan goods to Turkey and other countries. “Three countries including Azerbaijan, Georgia and Turkey provide good markets for Afghanistan’s vegetables and fruits. We tell farmers that their products will not remain unsold from now on,” Rahimi said. Herat residents said the inauguration of the Lapis Lazuli corridor was a “tremendous achievement” for Afghans and that it will prevent Afghanistan from relying on other trade routes for sending Afghan goods. “Through this corridor, we are connected to Europe and many other countries,” Herat Governor Abdul Qayum Rahimi said. From the nine trucks which went to Turkey through the Lapis Lazuli corridor, five trucks have returned to Herat while four others have entered the country through Aqina Port in norther Faryab province, officials said. 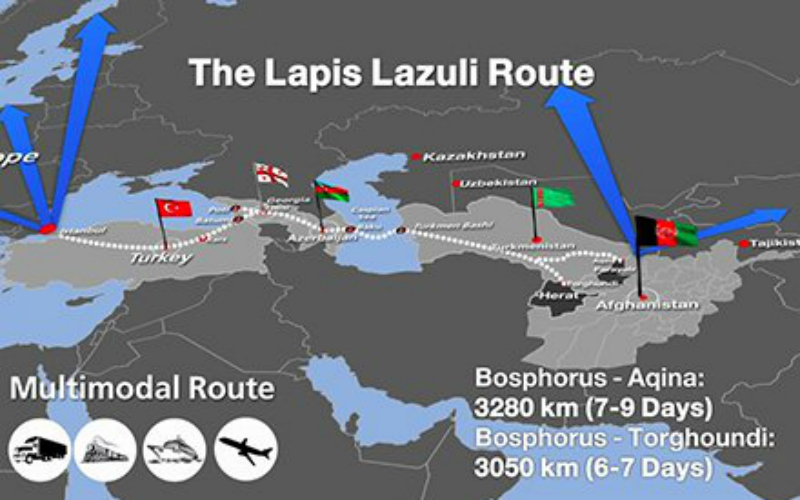 The Lapis Lazuli Route agreement was signed in October 2017 between Afghanistan, Turkey, Turkmenistan, Azerbaijan and Georgia. The corridor was inaugurated by President Ghani last year in December. The route begins in Afghanistan’s northern Aqina port in Faryab province and Torghandi in western Herat province and will run through to Turkmenbashi in Turkmenistan. The Lapis Lazuli Route agreement was finalized after three years of talks and was signed during the 7th Regional Economic Cooperation Conference on Afghanistan (RECCA VII) in Ashgabat, Turkmenistan. The first shipment that will be sent through the route on Thursday includes more than 175 tons of cotton, dried fruit and sesame. According to ACCI statistics, Afghanistan's annual import volume from Europe and Turkey through Iran is $900 million but the country’s exports to European nations totals $6 million a year. The Lapis Lazuli corridor connects Afghanistan through Turkmenistan, Azerbaijan, Georgia to the Black Sea and ultimately through Turkey to the Mediterranean Sea and Europe. The Lapis Lazuli corridor is a historic corridor. Almost 2,000 years ago, lapis lazuli stone was exported from Badakhshan in northeastern Afghanistan through this route to Europe. Local officials said the Lapis Lazuli corridor has provided a good opportunity for Afghan traders to send their goods to Europe.